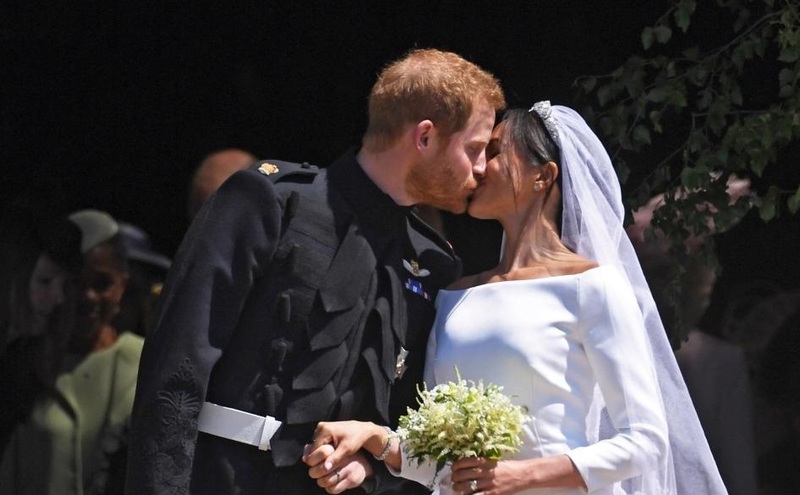 Prince Harry and his actress bride Meghan Markle married on Saturday in a dazzling ceremony that blended ancient English ritual with African American culture, infusing the 1,000-year-old British monarchy with a blast of modernity. In a medieval chapel at Windsor Castle that 39 English kings and queens have called home since 1066, Harry and Meghan exchanged vows watched up close by royals and celebrities, and from afar by a global TV audience of many millions. 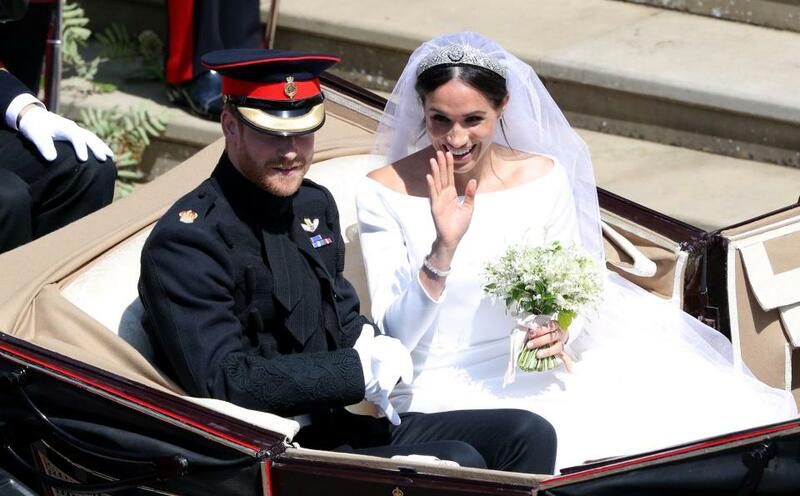 Wearing a veil, diamond tiara and a sleek dress with a long train, the American actress was accompanied up the aisle of St George’s Chapel by Harry’s father, Prince Charles, before she and Harry exchanged vows and were proclaimed husband and wife. 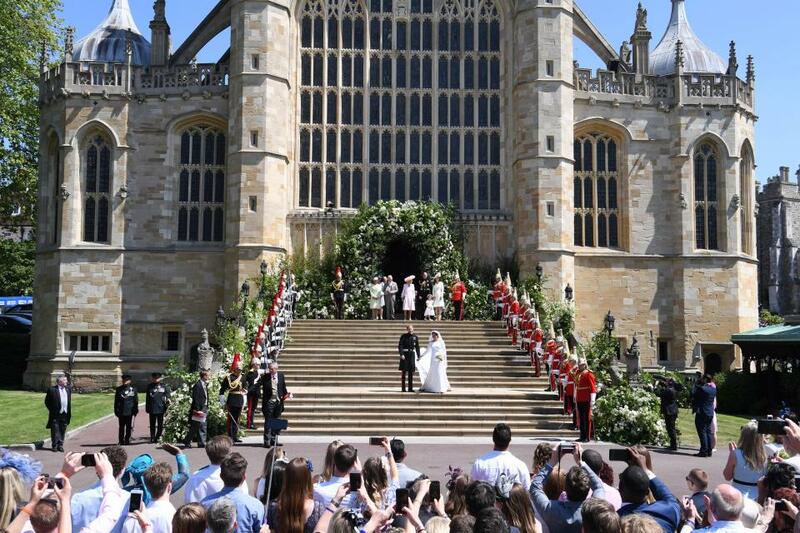 The couple kissed on the steps of the 15th Century chapel, before delighting the sea of well-wishers, some of whom had camped for days to witness the spectacular show of British pomp and pageantry, by touring Windsor in a horse-drawn carriage. The ceremony was typical of royal weddings in many ways. The service was conducted by the Dean of Windsor while Justin Welby, the Archbishop of Canterbury, declared the couple man and wife, beneath the banners of the knights of the Order of the Garter, the world’s oldest chivalric group dating back to 1348. The newlyweds will also be officially known as the Duke and Duchess of Sussex after Queen Elizabeth bestowed those titles on them. But throughout the wedding, there were significant breaks with tradition, in particular when U.S. Episcopalian bishop Michael Bruce Curry delivered a passionate sermon that was a far cry from the sober tones of the Church of England. “There’s power in love,” he boomed at a congregation that included Queen Elizabeth, senior royals and celebrities ranging from Oprah Winfrey to George Clooney and David Beckham. “Do not underestimate it. Anyone who has ever fallen in love knows what I mean,” said Curry in an energetic address that quoted Martin Luther King. African-American Karen Long, who was among the crowds in Windsor listening as the ceremony was relayed on loudspeakers, was one of those who appreciated the bishop’s fiery address. As well as traditional Church of England anthems and delicate English choral music, the ceremony also featured a gospel choir singing “Stand by Me”, the 1960s hit by American soul singer Ben E. King. Meghan’s mother, Doria Ragland, 61, accompanied her daughter to the chapel in a vintage Rolls Royce and shed tears of emotion at several points during the ceremony. Meghan entered the chapel unescorted, offering TV viewers and the congregation a first good look at her hotly anticipated wedding dress, which was created by British designer Clare Waight Keller of the French fashion house Givenchy. Harry, looking nervous, appeared to say: “Thanks Pa” to his father, and “You look amazing!” to his beaming bride. The world’s media have been gripped by the occasion, and television channels beamed the ceremony across the world. To some Britons, the marriage of a senior member of the royal family to the daughter of an African-American mother and white father embodied a modern Britain where race or background are no bar to even the most elite and traditional of institutions. To others, it was an irrelevance or a mild distraction from the schism of Brexit, which has deeply divided the United Kingdom. Polls suggested that most Britons would not bother tuning in. But in the narrow streets of Windsor, 30 miles (20 km) west of London, the enthusiasm from the vast crowds waving British flags and cheering was overwhelming, while thousands more celebrated at street parties held across the country. Air traffic controllers for nearby Heathrow Airport, one of the world’s busiest, even closed the airspace over the town for the 15 minutes before the ceremony to avoid marring proceedings with the roar of low-flying aircraft. Her sister, Lady Jane Fellowes, delivered the reading and the chapel itself was garlanded with white roses, the favorite flowers of Diana, who died in a car crash in Paris in 1997. Elton John, who sang at Diana’s funeral, performed at Harry and Meghan’s wedding reception, held in the castle’s St George’s Hall. The royal couple, who met on a blind date in 2016 and fell in love in a tent under the stars in Botswana, later left in a silver blue Jaguar E-Type for nearby Frogmore House mansion. Meghan, who was wearing a long white dress designed by Stella McCartney, was, in another break with tradition, to make a speech at the newly-weds’ evening event, to which about 200 guests were invited. Harry and Meghan will not immediately leave for a honeymoon and will carry out their first official engagement as husband and wife next week. Despite being unlikely to ever ascend to the throne as he is behind his father, brother, two nephews and niece in the line of succession, Harry has been at the forefront of efforts to modernize the monarchy in recent years, rejecting the uptight royal image to talk openly about his innermost feelings.